Now Available: "A Picture Perfect Murder"
Double click to view full-screen. Follow our progress on marketing the game here. Give us your feedback and suggestions. The whole area of trademark law (I am still not an attorney) turns out to be more interesting than I would have thought. Xavier Morales's website was the most fun. If you are planning to register a trademark, you definitely need a real trademark attorney, but here are a couple of interesting things that I think I've learned. First, an astonishing number of things can be trademarked, providing you are using them to identify or promote your brand or product. You can trademark a color (UPS brown or Corning pink), a sound (NBC chimes), a product name, an odor believe it or not, and a whole bunch of other stuff in addition to logos and slogans. The test seems to be that your trademark (1) isn't already in use by someone in your trade in your geographical service area, (2) can be associated in the public mind with your product as distinct from other companies' products, and (3) isn't a generic description of the product or the product itself. the word "apple" doesn't really have anything to do with computers. I noted yesterday that your trademark is your mark in the trade. Another important point is that it is your mark in your trade. For example, nobody other than DeltaTM Airlines can fly planes under the name "Delta." However, Delta Faucet Company trademarks DeltaTM plumbing fixtures, and Delta Brands International Corp. trademarks DeltaTM canned meats. No potential customer is going to confuse airline tickets, faucets, and canned meat. Before you slap a "TM" on your product, do some research and make sure someone in your trade isn't already using the name. Not doing that can be expensive, because when Delta Airlines finds out you are running, say "Mississippi Delta Airlines," they are likely to send you a strongly worded note, and if you don't knock it off, they'll take you to court -- and win! Because "Delta" is their established mark in the airline trade. Thanks to United Airlines for giving us a great example of the difference between your trademark and your brand. Your trademark is your mark in the trade. Both legally and practically, it is designed to help the customer distinguish your product from your competitor's product. Your trademark is a symbol of your product and your quality, and you don't want anyone confusing you with some other company because you have similar trademarks. Your brand, I've concluded, doesn't seem to be legally defined and more-or-less amounts to your reputation among customers. Several years ago, United Airlines' baggage handling and lack of good follow-up service exposed the brand to ridicule in the form of a song called "United Breaks Guitars." Then a few weeks ago, their refusal to let a couple of girls (ages disputed) onto a plane because they were wearing leggings exposed the brand to a furor of indignation about "fashion police." Four days ago, and undoubtedly the worst of all, a paid, seated passenger was forcibly removed from his flight and injured in the process, exposing the brand to horrified outrage. I'm not going to post a link to that one, because it's not a pretty sight, but YouTube already has dozens of videos. Consequently, the United Airlines brand is currently in the tank. They still own all the planes and the rights to all the gates, but their stock has gone down by almost a billion dollars and -- more seriously -- potential customers are swearing off United forever. Curiously enough, I suspect that this makes the United Airlines trademarks more secure than ever before! Remember, your trademark keeps the public from being confused with competitors. Right now, nobody wants to be confused with United Airlines! As near as I can tell without going to law school, the primary difference between a trademark and a brand is that "trademark" is legally defined, and "brand" means pretty much whatever the speaker or writer thinks it means. For example, I found one business-related that says, "The legal term for brand is trademark," which is apparently untrue. Neither the U.S. Patent and Trademark Office nor Harvard implies any such thing. At the opposite end of the spectrum, another website says, "At its core, a brand is a promise to consumers" about what they are going to get when they buy your product. You can often trademark your "brand name," which is a specific set of words, but I think most people use "brand" to mean something a lot broader than "brand name" or "trademark." As near as I can tell, your "brand" seems to be (very roughly) the sum total of everything people know, think they know, have heard, or feel about you. I used to have an attorney who occasionally would prepare some document that he called the "California baby talk version," meaning that it wasn't as complicated as he could have made it, but it would get the job done. I've about decided that the California baby talk version of "brand" is "reputation," and the only way to protect it is to do your best work all the time. If you find a legal definition on a government or law-school website, please let me know. I'm not an attorney, and everything is a lot more complicated than I can explain -- or even understand completely -- but I thought I'd talk a little bit about trademarks vs. brands vs. product names vs. copyright vs. intellectual property. I said yesterday that our URL is not trademarked. Trademarking something means that none of your competitors can legally use it. Since we would just love for 100,000 people a day to be using our URL, it would be silly for us to trademark it. On the other hand, you may have noticed that the dragon and the words "Storm Dragon Software" do have a little "TM" symbol beside them. That's because we want exclusive use of both the dragon alone and the dragon with the StormDragon font spelling out our brand name. In addition, the "TM" notifies our competitors that these things represent our brand alone, and that they should find another, different, non-stormdragon related name for their own software, lest they incur our fiery wrath. Yesterday Madison asked me for my reaction to an on-line ad that included a trademarked web address (URL). Now, I'm sure the reaction they were looking for was, "OOoo--they are so important that they trademarked even their URL. I am really impressed!" My actual reaction (as Madison expected) was, "They are trademarking their URL???? HAHAhahahaha! What a bunch of doofuses!!" Include it in your letterhead. Make www.stormdragonsoftware.com a household name!!! MWAHAhahaha!! That's called "free advertising," folks, and I'll take all of it that I can get. Tell all your friends about the non-trademarked URL, www.stormdragonsoftware.com. 02.16.17 Running a Small Business: Not Exactly Taxes 3. Finally, there are some fees and taxes that businesses have to pay just to be a business -- they don't depend on whether you make money or have employees. If you are in business somewhere, you probably have something similar to these. In Albuquerque, we have to have a business license. I gather that this is not optional and applies to all businesses; I know it applies to us. The license fee is small, and they usually send me a statement. When they don't send me a statement, I have to pay it anyway, or eventually they send me a statement that includes a late fee. When I asked how I was supposed to know it was due, the sweet young thing on the phone suggested that I read the city website. Right. I have nothing else to do at work than browse the city website to see whether I'm supposed to pay a license fee. Of course. So I put it into my little spreadsheet (see Taxes 1), along with the due date and a reminder that the city may or may not send me a statement. 02.15.17 Running a Small Business: Not Exactly Taxes 2. Another item that our CPA and attorney didn't fully explain to us is workers' compensation. Now, if you or someone you know has ever been injured on the job, or if you get safety briefings, you've probably heard of worker's comp. Very roughly speaking, it's a state-run insurance program that (in most cases) protects employers from being sued by injured workers in return for wage replacement and medical benefits to the workers. In New Mexico, there are (as always) exceptions, but it pretty much boils down to this for Ducks in a Row, Inc.: since we have three names on the payroll, we are covered by the requirements of the New Mexico Workers' Compensation Act. The Act requires us to pay a fee to the state and to buy a workers' compensation insurance policy. Certain owners can exclude themselves from the insurance requirements, however, and we initially didn't have to pay the fee or buy the insurance. So far, so good. Unfortunately, when we rearranged the stock and one partner's ownership dropped the teensiest bit below 10%, we suddenly had to pay the fee and get insurance -- but neither our CPA nor attorney mentioned this to us, and our mindset by that time was that we didn't pay it. Our insurance agent doesn't handle workers' comp insurance and also never asked us about it. Eventually I saw a article in the newspaper that talked about workers' comp in New Mexico, and surprise! I needed to get insurance! Neither the fee (which is very small) nor the insurance (which is expensive considering that it's for just one person) are "taxes," but we have to pay for them anyway. 02.14.17 Running a Small Business: Not Exactly Taxes 1. There are some federal, state, and local requirements on businesses that aren't exactly taxes, but you either have to pay them or do them anyway. When we incorporated, both our attorney and our CPA explained to us about six times apiece that we had to pay FICA, Medicare, FUTA, and SUTA. They told us how to do it and when to do it, and for the most part we did it without many mistakes and only minimal paranoia. It turned out that they didn't tell us everything we needed to know, and neither did anybody else. For example, after we'd been in business for several years, I read a little article in the paper about the New Mexico New Hire Registry. It was clear to me that I was supposed to have been registering employees with the NM New Hire Registry, and I never had done it. So I called them on the phone and said, "I'll do it now; how big a fine will I have to pay?" The lady replied that she didn't think they had ever fined anybody, and then she explained what I had to do. It's easy and free, but I'm required by law to do it. Every employer in the country (except a couple of federal intelligence agencies for specific jobs) has to report new hires to their state registry, even if the new hire works only a day or two. Why is that? Well, I call it the "bad dad" registry, or sometimes the "bad mom" registry, because one of the main purposes is to track down employed people who aren't paying their child support. You might not think that's any of your business, but think about this: in 2011, U.S. parents owed $14.3 billion in back child support. Do you know who's supporting a lot of those kids? You and me, folks, through our tax dollar. Somebody's got to feed them, so I don't mind that part so much, but I do mind that someone who is earning money isn't supporting his or her own kid. Consequently I really don't mind taking five minutes to comply with my obligation to the New Hire Registry. 02.13.17 Running a Small Business: Taxes 6. The third and final employment tax that I want to talk about is really two taxes, FUTA and SUTA. Never heard of them? You or someone you know has probably lost a job and "collected unemployment." FUTA stands for Federal Unemployment Tax Act, and SUTA is for State Unemployment Tax Act. You might think of them as supporting a form of "insurance" for people who lose their jobs through no fault of their own. The employer pays both of these taxes in most states. In three states, the employee also contributes to the state tax, but elsewhere the tax isn't supposed to be withheld from wages. FUTA is due annually (IRS Form 940), and state schedules vary. Remember that I'm not a CPA, but I find this tax a little more complicated than the others. For example, I have to pay (currently) 6% of each employee's wage in FUTA, but only on the first $7000. The rate is the same for all employers and has changed only once while we've been in business. Our rate for SUTA is quite a bit lower, but it keeps changing based on things like our company's experience history and the amount in our experience account -- whatever those are. In New Mexico, there are enough exclusions, exceptions, voluntary contributions, and rate changes that the whole system strikes me as completely arcane. What I know is this: I have to file quarterly, and I pay whatever rate they tell me for that tax period, which is typically way less than 1%. 02.01.17 Running a Small Business: Taxes 5. The second employment tax paid by both the employee and the employer is Medicare, which works similarly to the Social Security (FICA) tax except that the rate is a lot lower, only 1.45% each. Another difference is that, while Social Security has an income cutoff past which you don't have to pay the tax, Medicare has a cutoff past which the employee has to pay more, namely an additional 0.9% on anything above $200,000. Since I'm not a tax advisor or CPA and no one at Ducks has ever made this much, I've never had to do it. I think I'll just top everybody's wages at $199,999 and avoid the problem. HAHAhahaha! If we were making that kind of money, I'd get a tax advisor and CPA! 02.01.17 Running a Small Business: Taxes 4. My employees and I have to pay three "employment taxes." The first of these is the Federal Insurance Contributions Act (FICA) tax. Never heard of it? Try "Social Security tax." If you have a regular job, your employer must withhold 6.2% of your wages or salary whenever you are paid, up to the first $127,000 that you make. This is not optional, and it is not your employer's money; see Taxes 2. In addition, your employer must contribute the same amount. That is the employer's money until you get a check, and then it becomes the U.S. Treasury Department's money; however, in some mysterious way it is counted toward your Social Security benefits. I'm not a tax advisor or a CPA, so I'm not certain how that works; it probably has something to do with your W-2 form. All I know is that each employee costs me 106.2% of the wage or salary as a result of FICA. As an employer, of course I try to pass the whole 106.2% on to the customer; otherwise I eventually go bankrupt. The FICA tax rate has been stable since 1991, except for 2011 and 2012, when the employee contribution went down to 4.2%; the employer contribution remained at 6.2%. Self-employed people have to pay the whole 12.4%, so no whining from the ranks of the worker bees, please. Prior to 1951, self-employed people, like my farming grandparents, didn't pay this tax or get Social Security benefits. They sold the farm, used the cash to build two houses during their "retirement," and sold those at a profit. My Grandma called this "our Social Security." So no whining if you pay Social Security taxes and then retire in leisure, either! 01.31.17 Running a Small Business: Taxes 3. Recently in a large group, the leader asked, "How many of you still pay by check? Raise your hands." A lot of us, including me, raised our hands. He said, "How quaint," and we all laughed. I still pay the bills for Ducks in a Row by check, too. Writing a check once a year for, say, insurance, is easier and faster than setting up an on-line account, keeping track of the password and PIN, and figuring out the system each year from scratch. The main exception to my old-fashioned habit is in how I pay the taxes for Ducks. Gradually the federal and state governments have been moving to on-line deposit and filing, and (more slowly) I have been moving along with them. Somewhat to my surprise, paying the taxes online is easier and faster than checks, in most cases. Most of the on-line systems know who you are as soon as you log in, so you don't have to enter your various ID numbers, address information, etc. Some of the on-line systems give you the option of copying and modifying information for the previous tax period. Some of them do the math for you. Some of them automatically log you out if you accidentally forget to do that. I am not making this up: I can file and pay my New Mexico gross receipts and withholding taxes in 5 minutes. Federal employment taxes take me about 10 minutes on average for the deposits, because I have to do the math myself, plus I still have to file a paper form quarterly. When I was filing in Texas as well, their system was the fastest, although New Mexico has mostly caught up. There's another department, which will remain unnamed here, that stopped sending out the paper forms about a year before they put up their on-line forms, and that still has an on-line system that's a pain in the neck to use. (My CPA says the same thing.) Not all departments are equally friendly. But overall, if you are still paying your business taxes with paper forms and a check, you might try the on-line option and save the time for making more money to pay taxes on. 01.27.17 Running a Small Business: Taxes 2. I'm not a tax advisor or a CPA, but there's one thing I know for sure about collecting gross receipts taxes in New Mexico: it's not my money. (Your state may have a sales tax. Similar deal.) Before I make a sale, the money belongs to the customer. After I make the sale, the money belongs to the State of New Mexico. It never belongs to me; I just collect it on behalf of the State, and I turn it over on a schedule that depends on how much I collect. The gross receipts tax is not my money. This is why I have very little sympathy for the businesses who get way behind on their taxes: they had the money in their hot little hands, it didn't belong to them, and they spent it on something else anyway. That's not businesslike. 01.26.17 Running a Small Business: Taxes 1. It's everybody's favorite time of year, tax time. You may think you hate paying taxes, but paying taxes (at least in the U.S.A.) means that you made money. Would you rather pay taxes or be destitute? I rest my case. Businesses have their own set of taxes to pay, and in line with my philosophy of talking about what I know, I thought I'd spend a few days on some of the taxes that Ducks in a Row, Inc., has to pay. I'm not a tax advisor, and your business probably has a completely different set of taxes to pay anyway, but I'll share a few things I've learned over the years. First Point: Pay Your Taxes! On Time! In Full! When we incorporated, our attorney said that he could delay any creditor for five months, but if we didn't pay our employment taxes, we'd have to get a new attorney. I've always done my best to pay my taxes, and since I'm about the most paranoid employer in America, I normally pay them at the beginning of whatever the payment window is, rather than on the last day. I set up a little spreadsheet for each year that has sections for taxes due monthly, quarterly, and annually; a row for every tax and fee we pay; and a column for each month. When I pay something, I put an X in the box immediately. That way, I can tell at a glance what's due and what's paid, and (theoretically) I never pay anything late. This is also a convenient spot to make notes about the answers to questions that I ask the IRS or NM Taxation & Revenue. Yesterday I reported that the file transfers for my other website have increased quite a bit, but there is a good explanation. Meantime, the file transfers for this website increased enormously, without as good an explanation. Not counting the period of a Kickstarter campaign, this site has been puttering along at a few hundred file transfers per day for quite some time. But look at this! 3. Most likely, there was a mistake of some kind. I got in touch with my ISP, who looked at the complete data and noticed that thousands of these file transfers appear to be for comment bots from Russia and the Ukraine. The ISP sent us instructions on how to block these (which would be different for you). I'll let you know next month how it's going, but meantime, the moral is, don't get excited about a lot of traffic that you can't explain. The number of file transfers has more than doubled in the five months after getting the backlink changed. I don't see how this can possibly be a coincidence, but it does make sense. The linking site gets a lot of hits, it's closely related to my site, the link to my site is on their front page, and it's a text link, not just an ad-looking link. That's about as perfect a backlink as you can get. So the moral is, check your backlinks in the page source, not just in normal browser view. 11.18.16 Tools, Part 3: Game Editor 8. Putting in graphics is so easy that the grandson got bored and bailed on me, and besides, he has other commitments, like Minecraft. He says he'll come back for scripting. Storm SurgeTM has a number of built-in mini-games, and yesterday I worked on the jigsaw and tiling puzzles in "A Tiny Mystery." If you want puzzles with all pieces initially right-side up, they are almost trivial to build (once you've got the graphics). You put the pieces into their final, assembled position in the StormEd Scene Display window, copy the coordinates for each piece into the slot for final position, and move the pieces out of position. You're done. I'm not kidding. Now, if you want to rotate pieces, you have to do more graphics and a little scripting; I'll tackle that today for the jigsaw puzzle. Earlier comments on tools for game development. 09.12.16 What IS "A Picture Perfect Murder"?? Sometimes it's easy to get focused on the details of creating a game and forget that not every person in the world knows what a "hidden object/adventure game" is. Today, by special request, I'll give an overview of the genre and our game. These games go by several names, e.g., casual, hidden object, and adventure games. The "casual" part means that they typically take less than 10 or 15 to complete. Our beta testers, who are experienced in this type of game but did not take part in development, took roughly 8 hours to complete "A Picture Perfect Murder." The "hidden object/adventure" part tells what kind of puzzles you can expect. There's usually a plot of some sort, in contrast to, say, Match 3 games. Hidden object puzzles. Remember those drawings for kids where you have to find six hidden animals or whatever? Like that, only harder. Tile-matching puzzles. You turn over two tiles at a time until you find the ones that match. Tile-swapping puzzles. Sort of like a jigsaw puzzle. Spot the difference. Again, this is something you see in children's magazines, only much harder. Cycling puzzles. You turn groups of items around on interlocking tracks until they are in the correct positions. Adventure. Remember the House that Jack built? Say you need to dig a hole. You need a shovel. There's a locked shed. You can see a key inside a glass case. So you need a hammer. Eventually you find a hammer in one of the games, you go back to where you saw the case and break the glass (lots of random vandalism in these games), return to the shed, take the shovel, walk back to the place you need the hole, and dig the hole. In the bottom of the hole you find a clue. Playing each mini-game gets you a tool or clue. Finally, you use all the clues in a fairly difficult logic puzzle to solve the murder. So that's what it's all about. It's fun; buy today! 09.10.16 Running a Kickstarter campaign. What do you suppose Kickstarter has in common with driving traffic to your website? Right! In both cases, the rich get richer and the poor get ignored. It's a lot easier to raise money through crowdfunding if some crowd somewhere is already panting for your next game/movie/CD/book/whatever. For the rest of us, the Kickstarter success rate is only about 35%. First, our goal was only $5000. This wasn't nearly enough to finish the game, but it funded our intern for long enough to finish a specific aspect of the game. We squeaked in with $5101, but if we had asked for much more, we wouldn't have gotten anything. You must be realistic about how much money an unknown can raise. Second, we made what I considered (as the writer/director/editor, so some bias there) a funny video for the campaign. Third, we posted quite a few updates in an effort to remind potential contributors that we still wanted and needed their help. Finally, we pestered our family and friends with email until they contributed just to shut us up. Remember: organized begging. I think we sent out three or four rounds of requests. Some people actually thanked us for sending the reminders, saying that they had intended to donate the first time and then forgot. Ultimately, our Kickstarter campaign was a lot of work. We did manage to fund our intern for a while, but the income/hour was not particularly high. (It turns out that Clang had the same problem, even though they made $526,000.) If you only need a few thousand dollars, you may want to consider getting a part-time temp job instead. 09.09.16 Legal ways to fund game development. The one thing you need to know if you decide to go into consulting is this: Save money while you're making it. (Knowing something about the topic is also helpful.) Consulting is always flood or drought. 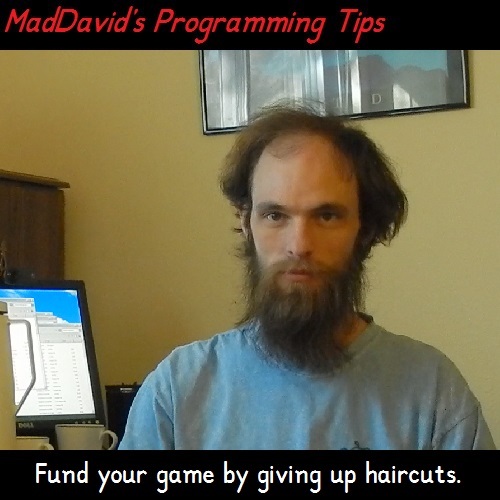 Fortunately, we already knew this when we started consulting, so when we switched over to working on our indie game full time, we had some savings to pay a lot for things we needed for the game and a little for salaries. I'd say that lasted for a year or so. Then we were really, really broke, and the game wasn't done. Go hungry. That would have been okay for a day or two, but it wasn't a long-term option. Get a job. This one would have brought us back to time=money, seriously delaying the game. We decided to go with begging, although apparently I was the last person in the universe to learn about Kickstarter. One of my sons showed me the (very glossy) campaign for some sort of real-motion sword-fighting game engine called "Clang", but at first I had no clue how this related to my need for cash. When I finally got it, and when we had been broke for quite some time, Madison and I decided to try a Kickstarter campaign of our own. 09.08.16 You want to build an indie game? You've seen the warnings: "We're professionals. Don't try this at home." You probably don't have to be a professional to build an indie game, but you do need a modicum of skill, loads of stick-to-itiveness, and either a big team or a lot of time. I'm going to walk you through the process that we followed to fund, create, and market "A Picture Perfect Murder." You may decide to go for it, or you may decide to work for a living, which -- I'll be honest, here -- is more reliable and less time-consuming. The first problem, of course, is eating. It may come as a surprise that until you are already selling games, no one is going to pay you to build your indie video game. If you're living at home with mom and dad, no problem, but otherwise you need a job, and at first we had contracts designing and developing software for a client. This provided the money we needed, but as you know, time = money. Therefore we didn't have the time we needed, and for a while progress was very slow. When the contracts ran out, we suddenly had more time. Then the money ran out as well. Tune in tomorrow to see what we did about that. 09.07.16 "A Picture Perfect Murder" makes a sale on Amazon! Yay! We've sold "A Picture Perfect Murder" on Amazon! Since virtually every relative, friend, and acquaintance we have contributed to our Kickstarter campaign, initial sales have taken a little while to get started. Our good friend Cynna McLaughlin has three books out, and she says she gets a little endorphin rush every time she gets royalties, even if it's her mom who made the purchase. But we're excited because apparently a stranger to us has bought our game. Whoever you are, if you're reading this, thanks, enjoy the game, and please leave a review on Amazon! 09.02.16 Driving traffic to your website: A Baker's Dozen Hints. Driving traffic to your website is hard work. Unless you are made out of money, you're the one who has to do it. Even if you are made out of money, SEO offers should be viewed with scepticism. You can do it yourself better and cheaper. Add material regularly, even "daily," although I add occasional large chunks of material to my other website, and that seems to work fine. A good solid first sentence, in a good first paragraph, reflected in a good description of 155 characters, is essential. A title telling what each page is about in 55 or 60 characters is one of the few things you actually control. Search engines don't look at comments, but people can, so be careful what you put in them. Don't obsess about keywords. Google and Yahoo don't use them and may penalize you for spammy ones. Do obsess about backlinks. Get on directories. Ask for links from related pages. Post useful comments on other sites. Traded links are of lesser value, but not worthless. Paid links are of almost no value. Link out to related sites, but check your site regularly for broken links. Figure out what you can give away for FREE. It's the most powerful word on the web, aside from "cat." 08.15.16 "A Picture Perfect Murder" is on Humble Bundle! We're pleased to announce that you can now buy our game, "A Picture Perfect Murder" on Humble Bundle as well as here in our own store. I haven't completely figured Humble Bundle out yet; Madison is the one who has been working with them. It is clear that they are an established store for computer games and digital comics, at least. They apparently run specials where a few games or comics are bundled for sale together. Part of the purchase price goes to charity. As I learn more about Humble Bundle, I'll let you know. 07.15.16 2:00 p.m. 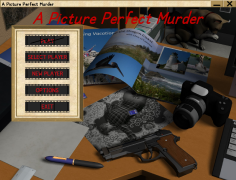 This just in: "A Picture Perfect Murder" is for sale on the Amazon Digital Game Store. In addition, there are two books titled Picture Perfect Murder and one titled A Picture Perfect Murder, not to mention numerous other books titled A Picture Perfect [Something]" or [A] Perfect Murder. Now, I distinctly remember checking the title at the time without finding much of anything. I guess this title is just an idea whose time had come. 07.15.16 "A Picture Perfect Murder" is finally finished and "on the market." What this means, in practice, is that instead of spending our days doing something we know how to do - software development - we spend our days doing something we don't know how to do - selling software. There are a number of online game retailers, and so far we've been in touch with seven of them. Two have not responded at all. One said it wasn't their kind of game. One said they need "Steam keys," which means you have to be on Steam. One said they "wanted to like it" but thought it would be too difficult for their customers to play. One is taking a long time between steps, and one seems to be in the process of accepting it. We haven't tried Steam yet, because as near as we can tell, Steam is now crowd-sourcing the decision on what to accept, and no one has heard of us. Which brings us back full circle to doing what we don't know how to do: marketing. All that said, obviously you can and should buy the game here! 07.16.16 One of our Kickstarter rewards was a signed certificate with unique art work from the game. One backer immediately framed his certificate and hung it in his den! While we were creating the physical certificates, I decided that "next time" we will do digital certificates that people can use as the desktop wallpaper on their computers. After this backer's reaction to the paper certificate, I may have to rethink that.